We are knee deep in the process of deciding on a Kindergarten for Oscar next year. We’re leaving no stone unturned when looking into public schools, private schools, charter schools, and even homeschooling. What I have found interesting is every time we research a certain option, we find it isn’t quite what it seems at first glance. We want to make an informed decision for our kids so getting a second (and third and fourth) opinion has been really helpful. My husband and I aren’t your typical impulse shoppers. I mean sure we might grab a candy bar in the checkout line once in a while. But when it comes to major decisions we like to take our time and do our homework. 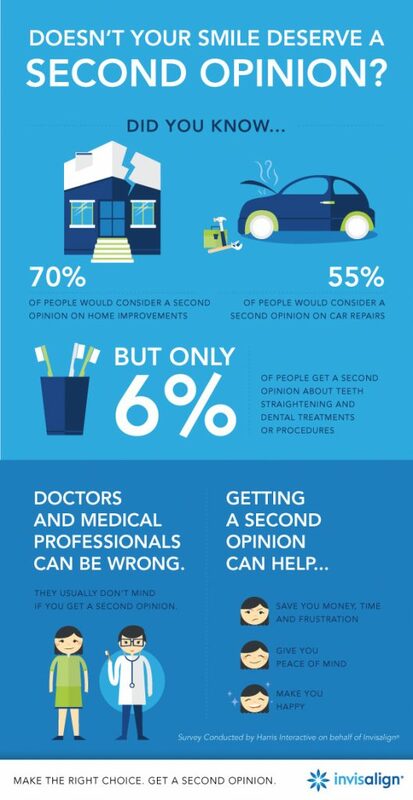 When the folks from Invisalign asked me to share about the importance of getting a second opinion, I immediately thought of our current dilemma. We are doing our research when it comes to the schools we want to tour. On paper, they look really great. But I haven’t met a single parent who told me not to tour each school we are interested in. It’s crucial to not only look at grades and logistics, but to really get in there and walk around, see the kids and the teachers and get a feel for the place. As someone who loves to plan, this makes complete sense to me. In our house, we often get a second opinion on our major decisions whether it’s medical, a big purchase or even somewhere we want to travel. We rely on the experiences of others to guide us. That’s not to say we just follow the crowd, but if someone we trust has had a bad experience, we want to learn from it. Likewise, if a professional gives us their honest opinion, we respect it. I am working with Invisalign to learn about dental health and all the options available using their invisible braces technology. Besides being much more cosmetically appealing than traditional metal braces, Invisalign gives teens and adults the ability to get the correction they need without food restrictions. Hooray! I never had braces growing up, but I have wanted to look into getting them as an adult because the older I get things seem to be moving around on my bottom row of teeth. And while I haven’t yet had an assessment, I would hope Invisalign would be an option for me. You can bet I will be getting a second opinion on that one! Learn more about Invisalign and win! To help bring awareness to the importance of a second opinion, Invisalign is giving away $50 a day in instant win prizes through Oct. 15 plus a chance to win a $1,000 grand prize in their Second Opinion Sweepstakes and Instant Win. Enter each day until you’re a winner! Like any other major decision, I would take my time and make sure I had several opinions before taking the plunge. I would rather do my homework than later regret my decision. I can ask for all the opinions in the world, but the ultimate choice is mine and I want to be at peace with it, come what may. How important is a second opinion to you?